Prescription drug costs consume the largest proportion of dollars spent on healthcare premiums, with 22 cents out of every dollar going to medication costs, says AHIP in a new data brief. Eighty percent of every dollar is spent on medical expenses, and the remaining 20 percent was split between operating costs and net margins, showing that payers are adhering to the 80/20 rule instituted by the ACA. “This is the latest evidence that shows prescription drug costs are out of control,” said Marilyn Tavenner, President and CEO of AHIP in an accompanying statement. The AHIP report used data from premiums contributed by patients under 65 who were continuously insured. Outpatient services consumed 19.8 cents of every dollar while 15.8 cents were spent on covering inpatient services. 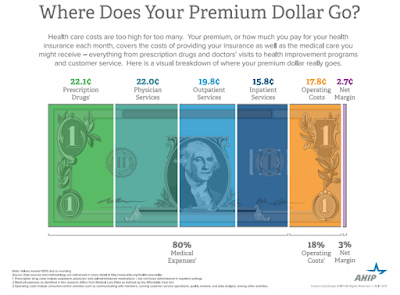 Operating costs for payers were 17.8 cents per premium dollar. In 2014, healthcare expenses totaled $104 billion. Prescription drug spending accounted for $28.9 billion and physician services accounted for $28.8 billion. Outpatient and inpatient services, respectively, cost $26.1 and $20.7 billion.